"It is possible to have the fence removed and all other unlawful agreements with Hampshire County Council "
Thanks for your letter accepting that I will put all my communications to the public at large as it is at their request. 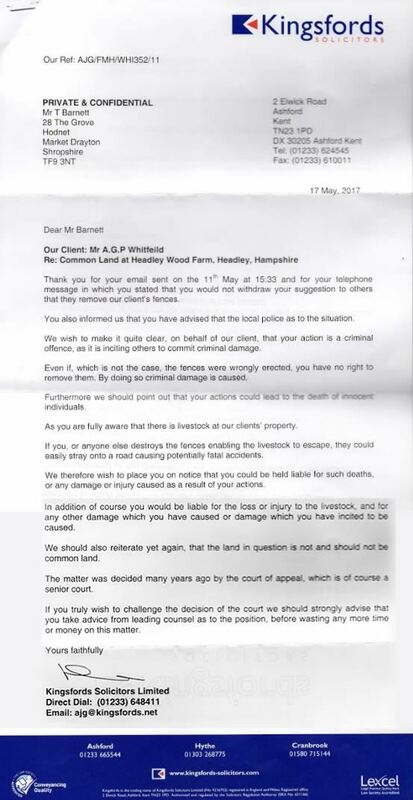 The rights to remove "impediments" from any public rights of way is secure in law, but to save a lot of unnecessary use of emails/letters I have a few questions that you will need to answer should the matters go to court therefore I draw your attention to G&K Ladenbau Ltd-V- Crawley & de Reya (1978) 1WLR 266, it was held that a solicitor who Negligently failed to search the register of common land was held liable to a client who suffered loss as a result, my question therefore is Have you made a complete search of Broxhead Common Land yourself to make such claims "your client" has legal/lawful occupation of any of the land apart from commoners rights? The conveyance act/legislation makes quite clear that for anyone to use property not belonging, as collateral, is mortgage Fraud, but then the 2006 fraud act also make clear that false representation is also fraud. Schedule 4 para 6 any member of the public may "enforce" against any unlawful works on common land, the fencing is unlawful works, for such works to be undertaken before 2006 would have required consent from the secretary of state under section 194 1925 law of property act, also in that act section 193 provides for access to common land from all points of view by the public to all ancient bridle paths and footpaths, your client now would need to apply under the new act of 2006 for consent to make a fence but he will not get retrospective, all of this will be heard at a public enquiry. It is possible for case management but without compromise to have the fence removed and all other unlawful agreements with HCC. Thanks for your letter of the 17th accepting that I will put all my communications to the public at large as it is at their request. "I now draw your attention to a statement you have made which shows in the penultimate paragraph on page 2, how can it be you consider that the appeal court made an order when the case was not heard because it was withdrawn"